The American Planning Association's annual Planning Law Review (Wednesday, July 5, 2017), which will include a discussion of the case (wit John Echeverria, me, Patricia Salkin, Deborah Rosenthal, and Nancy Stroud). The ABA's Real Property, Trusts and Estates Section is producing their free Professors' Corner, "Murr v. Wisconsin and Its Impact of Regulatory Takings Law" (July 11, 2017) (with Carol Brown of Richmond Law, and Bethany Berger of U. Conn). U. Wisconsin Law School's annual Property Rights and Land Use Symposium (July 20, 2017, Madison) (with Michael Berger, John Groen, Misha Tseytlin). 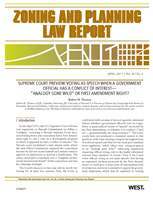 ALI-CLE's on-line program, "The U.S. Supreme Court and Property Rights - The 'Larger Parcel' Issue and the Future of Regulatory Takings" (July 25, 2017) (with Sara Beachy, Michael Berger, John Groen, and Steven Eagle). "Murr and Beyond: Implications for Regulatory Takings" (ABA Annual Meeting, NYC, August 11, 2017) (with me, John Groen, Misha Tseytlin, and Nancy Stroud). In the interim, here's what you need to pick up and read, to prepare yourself for the uncertain future. First, read the amicus brief of the United States. This is the source of the problem, and the majority followed this brief's argument fairly closely. I join THE CHIEF JUSTICE’s dissent because it correctly applies this Court’s regulatory takings precedents, which no party has asked us to reconsider. The Court, however, has never purported to ground those precedents in the Constitution as it was originally understood. In Pennsylvania Coal Co. v. Mahon, 260 U. S. 393, 415 (1922), the Court announced a "general rule" that "if regulation goes too far it will be recognized as a taking." But we have since observed that, prior to Mahon, "it was generally thought that the Takings Clause reached only a 'direct appropriation' of property, Legal Tender Cases, 12 Wall. 457, 551 (1871), or the functional equivalent of a 'practical ouster of [the owner's] possession,' Transportation Co. v. Chicago, 99 U. S. 635, 642 (1879)." Lucas v. South Carolina Coastal Council, 505 U. S. 1003, 1014 (1992). In my view, it would be desirable for us to take a fresh look at our regulatory takings jurisprudence, to see whether it can be grounded in the original public meaning of the Takings Clause of the Fifth Amendment or the Privileges or Immunities Clause of the Fourteenth Amendment. See generally Rappaport, Originalism and Regulatory Takings: Why the Fifth Amendment May Not Protect Against Regulatory Takings, but the Fourteenth Amendment May, 45 San Diego L. Rev. 729 (2008) (describing the debate among scholars over those questions). 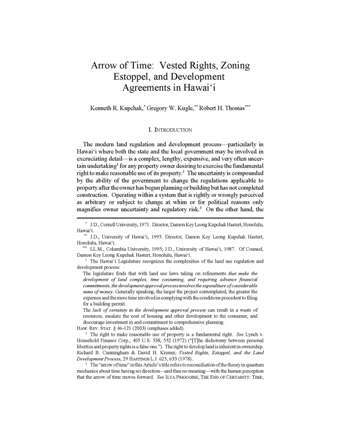 Next, download a copy of Professor Rappaport's article here. In sum, he suggests that we shouldn't be talking about the Fifth Amendment when we talk regulatory takings, but about about the Fourteenth Amendment's Privileges and Immunities clause. In that vein, you also need to read Justice Thomas' concurring opinion in a Second Amendment case, McDonald v. City of Chicago, and also this, for the state of play of whether anyone but he sees the P&I Clause as the way to go, or if that's "too far" for now.